We are looking forward to a trip to Chicago sometime in the future, because the city, along with New York, of course, seems to be leading the U.S. as a hub of exciting digital signage. 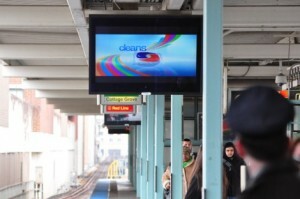 Titan, which refers to itself as the largest ‘People in Transit’ advertising company, has extended its agreement with the CTA, the second largest U.S. transit market, by an additional five-years, the extension meaning that Titan will be exclusively representing the CTA and its Bus and Rail static and digital media through December 31, 2019. The CTA agreed to an extension of the contract in part to allow Titan to continue to bring innovative new media to its system. As part of the extension, Titan will install approximately 100 new digital screens in the Chicago loop, replacing the static Urban Panels located at subway entrances and exits. This new addition to the CTA’s digital network will create unprecedented digital media access to the core downtown Chicago area and generate incremental revenue for the CTA. Titan has served as the CTA’s exclusive sales contractor since it first won the contract competitively in 2007. Titan has worked with the CTA to evolve the media offering into one of the largest digital networks in the country, allowing brands to connect with consumers in new and interesting ways, as well as providing riders with track and train information and other relevant content. The CTA serves 1.6 million passengers each weekday across its Bus and Rail network. Titan also sells the advertising on the Pace transit system, giving the company dominance across the entire Chicago DMA. This entry was posted on Tuesday, January 29th, 2013 at 10:02 @460 and is filed under DailyDOOH Update. You can follow any responses to this entry through the RSS 2.0 feed. You can leave a response, or trackback from your own site.